Click a blue link to view my page on the San Francisco attraction. On the bay lies Alcatraz Island, which is a Hillman Bronze Medal winner. It is the former high-security federal prison for nefarious criminals like Al Capone. Frequent tour boats take you there. 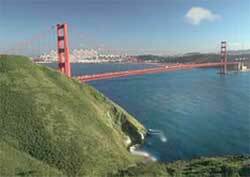 Beautiful San Francisco Bay is the world's largest deep-water harbor. It frames the lovely San Francisco city, which was built on 46 hills. This helps create the charming undulating cityscape adorned with mostly small buildings. Skyscrapers have been kept to a reasonable number. They, too, are a Hillman Bronze Medal winner. They are also dignified as National Historic Monument, a formidable title for these quaint cars. Three lines operate up and down San Francisco's steep hills. One of the two largest Chinese communities outside the Orient. Grant Avenue is the main drag, where numerous restaurants thrive. Tourist restaurants everywhere. Many overlook picturesque fishing boats. Outdoor vendors cook crabs in huge, steaming vats. San Francisco's most famous landmark. It's 60-stories high. Its main span stretches 1300 meters (4200 feet) over water. Though some new bridges in the world have eclipsed its engineering feats, it will always be stunningly attractive. Steep, bricked street with eight curves in a single block (descends from Hyde Street).